Obama's Problem: The Path Forward In Syria Is No Clearer : It's All Politics Despite the president's Syria speech, the path to congressional authorization of military strikes in Syria is no easier than before. The timing of when, or even if, Congress will hold votes is now an open question. 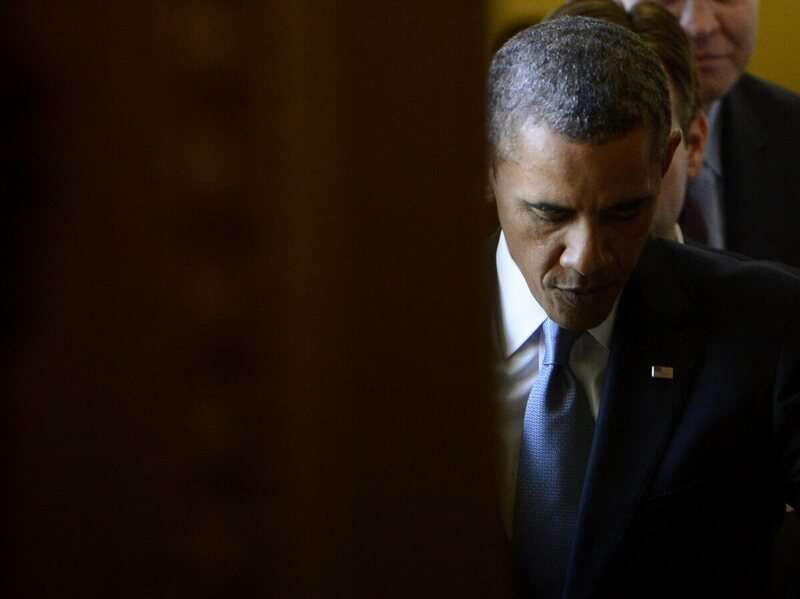 President Obama walks out of a meeting with the Senate Democratic Caucus at the Capitol on Tuesday. With the highly anticipated Syria speech behind him, the path ahead for President Obama's effort to get congressional authorization of military strikes in Syria is no easier than before. In fact, post-speech, it seems more obstacle-strewn and steeper than ever. The speech put Congress no closer to voting to authorize strikes. Even the timing of when Congress will hold votes is now an open question. Senate Majority Leader Harry Reid, D-Nev., postponed a planned Wednesday test vote and set no new date. House GOP leaders never announced a date for a vote and perhaps now won't have to. The problem for the president is that whatever uncertain impetus there was for Congress to approve military strikes, it was slowed by Russia's proposal that the Assad regime place its chemical weapons under international supervision and that the U.N. be involved. The paradox is that it was the big stick of threatened U.S. military strikes that apparently led Syria to officially acknowledge, for the first time, its possession of chemical weapons. Now Obama wants the even bigger stick of a congressional authorization to keep pressure on Syria. That means Obama and his national security team face days, perhaps weeks, of the challenge of countering this attitude that Congress need not act on an authorization until diplomacy has run its course. "I think it's important that we give the president credibility as the leader of our country, as the principal person for making foreign policy as well as the commander-in-chief. ... I don't think there's any doubt that the failure to do so will weaken our country, create a more dangerous international environment, and to some degree undermine the president of the United States." But Obama's problem is that there aren't at least 217 more lawmakers in the House who would vote with Hoyer. And there likely aren't enough votes in the Senate, either. It's worth noting that with the limited number of legislative days Congress has left to deal with huge fiscal policies like funding the government past September and increasing the debt ceiling, Congress doesn't have a lot of bandwidth to devote to a lengthy and complicated continuing debate over Syria. If, and it's still a big if, Obama's threats eventually lead Syria to place its chemical weapons under international supervision and those stockpiles are destroyed, it would be a major achievement for the president. There would still be many questions, however, about the road, with its red line, that he took to get there.